You don’t get to decide what will or won’t leave an impression on someone else. You don’t get to decide what will or won’t leave an impression on you. You can try. I mean, you can say that you’re in control. That doesn’t impact me. But you’re human, and as humans we’re really bad at this. And as humans it’s really important we realize how powerful we are. That our words matter. A lot. That our habits matter. A lot. The greatest impact we have, is on each other. Parents of young children seem to all share this moment… the moment their child parrots what they say. It tends to have the same reaction. I didn’t realize they were paying such close attention. They sound just like me. I need to be more careful what I say. The secret is that kids aren’t the only ones paying attention. Your influence extends beyond the minivan. Your influence happens in the restaurant. In the meeting. In the kitchen. In your Facebook newsfeed. In your Instagram story. Your influence happens with your words. Your habits. Your choices. Your response. It’s a big responsibility. Being human. Sometimes influence is less serious, less weighty. Three friends introduced me to three different bands*, and hearing any of that music today transports me back to our friendship as children and I smile. Watching Something About Mary caused me to cut my hair super short and I loved it. A trip to Germany changed the way I appreciate beer. But most times influence is weighty. It lingers. Into adulthood. Into your marriage. Into your job. Into your parenting. And influence comes in all forms. What you say. What you share. What you do. What you don’t do. You don’t get to decide what will or won’t leave an impression, but you can improve the odds that your influence is a good one. So, what are you contributing to the world? Some of the things that influenced me the most, were moments someone didn’t know I was paying attention. Or when someone didn’t think it was a big deal. Or they thought I shouldn’t care. But I was paying attention. It was a big deal. And I did care. They changed me and how I choose to interact with the world. One sentence said to me in junior high, resulted in me being a business major instead of pursuing writing as a career because I was told I couldn’t make money as a writer. Despite winning a scholarship for my writing. Watching someone wash the floor by hand without complaint, showed me that love is a verb about sacrifice. One sentence said to me in high school with sincerity, changed the way I viewed my body for the better. Despite someone else who would later tell me I was not attractive. Scrolling through a series of images led me to buy things I didn’t need and led me to feeling lonely. Despite having abundance and being surrounded by amazing people. One sentence the first year I was a manager, gave me the strength to continue when I didn’t think I was enough. Observing consistent kindness and patience of waitstaff taught me to be thankful and gracious and generous. One chapter in one book, brought me one step closer to Jesus. A series of responses I observed led me to decide it is safer not to tell someone the truth, because I am afraid they will be mean to me or leave me behind. One sentence helped me feel understood, loved and seen, in the midst of my choice not to be a parent. One deliberate sentence and loving look got me to sit down on a couch and talk it out, changing how I view and approach conflict for the better. You don’t get to decide what will or won’t leave an impression on someone else. You don’t get to decide what will or won’t leave an impression on you. You do get to decide whether to care. Whether to try. Whether to be better. Your words matter. You don’t get to choose whether or not they will be remembered, so take time before you choose to say them. They will push some people away. They will draw some people in. They will cause people to see themselves differently. Words can instill courage or doubt. Confidence or fear. Love or hate. Your words tell someone whether or not they matter. And we all matter. Your habits matter. You don’t get to choose whether or not they will impact you. Or those around you. What you are exposed to can influence you. For better. For worse. So be intentional with what you choose to consume: Food. Drinks. Music. Movies. TV. Social Media. Books. Articles. When I changed what I ate, my cholesterol got better. When I changed the music I listened to, the lyrics that got stuck in my head were uplifting. When I took a break from social media my anxiety dropped and I worried less. Habits matter. For you and for those around you. Your habits can become their habits. Your circles matter. Who you associate with changes you and it changes them. That’s why your parents were so worried about your friends growing up. Because they knew we could be influenced. But they might have missed that we had the ability to be the positive influence. We don’t always get to decide though, whether our positive influence is enough to overcome the negative. Build others up. Don’t tear others down. Encourage. Don’t derail someone’s dreams. Research the truth. Don’t spread incomplete or inaccurate information. Ask how you can help. Don’t tell someone it’s dumb. Ask questions to understand their perspective. Don’t tell someone they’re dumb. Respond with curiosity. With kindness. Not rage. Not insults. And if you find yourself in a circle, where everyone else is the latter, and you’re the only voice on the positive end of the spectrum… choose. Choose to stay and be the positive voice if you can. Choose to walk away if you need to. Choose to stay, but also find another circle to add to your life. A circle that builds you up. That encourages you. That asks how they can help you. That asks about your perspective. That responds with kindness. That introduces you to things that make you smile. And if you find yourself in a circle, where you are the latter, you are the negative voice… Reset. Resist the temptation to get defensive. To demand you are right, or your rights. Take one step forward in a positive direction. Read something positive. Watch something positive. Ask someone positive to walk with you. One of the hardest, most honoring moments I was ever gifted, was delivering the eulogy at my Busia’s funeral. I reread it as I was writing this. And I am reminded of her positive influence. She was not a perfect woman and she made mistakes. But her positive influence is her legacy. She was the positive in many of our circles. What are you contributing to the world? Because you are contributing something in every moment. Be a human that helps other humans be better. *Thank you Emily W for Weezer, Joe M for MxPx, Joe H for Alkaline Trio… I rocked out last week getting ready for work, at work, after work and couldn’t stop smiling. 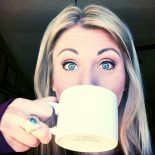 This entry was posted on April 14, 2019 by jessica lynn shull in myfaith and tagged faith, influence, positivity.